● There is a sale section of the website where you can receive up to 50% off items. ● Shipping costs are calculated based on the subtotal of the order. Orders up to $60.00 have a shipping cost of $9.95. Orders from $60.01 to $125.00 ship for $11.95. For any order over $125.01, the shipping cost is 12% of the subtotal. ● You can upgrade to economy, overnight, or express shipping for a fee. ● Sign up for the email newsletter to receive frequent discounts, like free shipping or up to 50% off select items. ● For Canadian and international customers, Crazy Shirts will reimburse the return shipping charges for your country’s postal system. 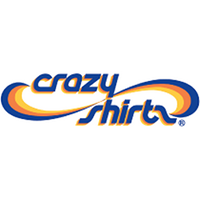 At Crazy Shirts, you have the opportunity to shop for a wide variety of unique shirts for men, women, and even for the kids. If you don't find anything you like amongst their massive inventory of shirts, you can check out what they offer in the way of custom-printing opportunities. Beyond that, Crazy Shirts offers shirts under The Classic Crew line, featuring shirts that utilize a wide array of dyes and designs. There are also long-sleeve shirts, polo shirts, tank tops, V-neck shirts, jackets, and much more. For women, you can shop for t-shirts, pullovers, jackets, tank tops, split V-neck shirts, and more. You can also check out a variety of special collections. For most up to date offers check out Crazy Shirts on Facebook and Twitter or contact Crazy Shirts Support for any questions.